This is a follow up article exploring the idea a phone call was placed approximately 10-12 minutes after the Lake Herman Road murders of David Faraday and Betty Lou Jensen on December 20th 1968, using the concept of a 'laughing killer' and the disputed 1986 'Zodiac' letter to the San Francisco Chronicle. Many magazine and newspaper articles are littered with basic errors regarding the Zodiac case, however some recurring themes not widely recognized as fact are present in many. One can see the embellishment in the fact the newspaper reported 34 stab wounds as opposed to 16, so did the killer really laugh in a frenzy during his attack on Cecelia Shepard. The second article involves the Argosy Magazine dated September 1970 and the murder of Paul Stine on October 11th 1969, two weeks after the Berryessa attack. The following is extremely unlikely, but was a section of the October 13th 1969 letter omitted from public consumption in similar fashion to the phrase 'by knife' written on the car door of Bryan Hartnell's Karmann Ghia, to provoke a reaction from the killer. It is highly doubtful, and likely sensationalized reporting, however this magazine article actually adds a phrase attributed to the killer, written in the October 13th 1969 Paul Stine letter to the San Francisco Chronicle. 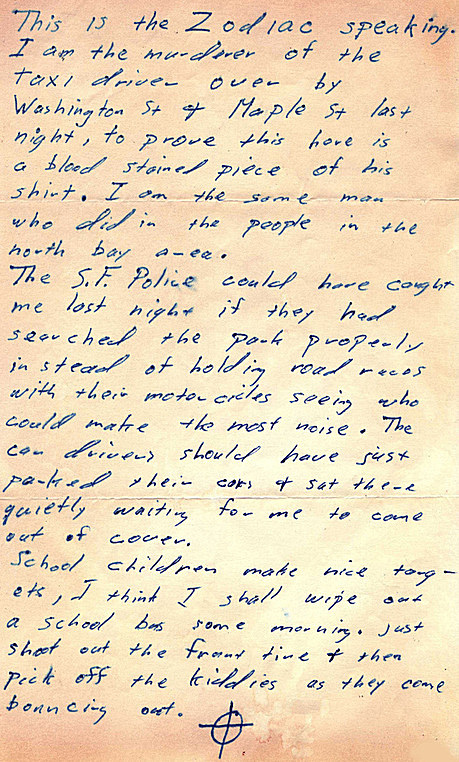 The article read 'Four days after the murder of Paul Stine yet another scrawled letter arrived at the San Francisco Chronicle. With it was a bloodstained piece of cloth, later established by laboratory technicians as a small part of the missing swatch ripped from Stine's shirt. The rambling letter, signed with the crossed-circle symbol, began, as had the others, with "This is the Zodiac Speaking." The writer went on to say that he was the killer of the cabbie-student, adding "and to prove it, here is a piece of his shirt." The letter also disclosed that the fugitive, from some nearby hiding place, had watched with uncontrollable amusement while police searched the area. He said "they could have caught me if they had done it right, instead of dashing around waiting for me to come out of cover. I like to died laughing." The Front Page Detective Magazine article of February 1970 stated "He (the killer) dropped to his knees and slowly, deliberately, forcefully plunged a 12-inch, double edged knife into Bryan's back 10 times. When the youth fainted in pain, the killer turned on the girl. His demeanor changed, kneeling beside her, he laughed wildly as he plunged the dagger 20 times into her back in a frenzied assault." In April of 1974 Detective Cases Magazine covered the Berryessa stabbing: "He ordered Miss Shepard to tie up Hartnell, then he bound the girl, hands and ankles. The gun had been replaced with a knife and when both victims were securely trussed, the hooded monster began plunging the weapon repeatedly into first, the man, then, the girl, accompanying each thrust with a maniacal laugh. For what seemed an eternity to the horrified, screaming, helpless victims, the merciless butchery continued. Their torturer first slashed, then stabbed as his hideous laughter echoed along the banks of the lake." Officer Pierre Bidou remembered a 'crank call' after the Lake Herman Road murders. He described this to the Benicia Herald newspaper ""Bidou and his partner had served a warrant on a Lake Herman Road cabin Dec. 20, 1968, and were on their way to deposit some marijuana in the police department’s evidence locker when they were dispatched back to Lake Herman Road. Initially, they were told a woman was lying outside a car; they thought they were being sent to a crash. Police at first speculated it might have been a crank call, but the officers headed back north. But when they arrived, Bidou realized it was no crank call and no car accident. Instead, it was a sinister crime scene." Officer Pierre Bidou also recalled this 'car accident' to Zodiac investigator Michael Butterfield. “…we got the call from the dispatcher that an accident, or something, had occurred on Lake Herman Road, so we turned around and came by.” Source. This is from a previous article: 'When Stella Medeiros observed the crime scene at 11.20 pm, she raced off to seek help in Benicia, eventually locating Captain Daniel Pitta at the Enco Gas Station on East 2nd Street. This is 3.4 miles from the turnout, an estimated journey time of 5 minutes on Google Maps. She is obviously driving faster than normal and flags down Captain Daniel Pitta probably slightly shy of 11.25 pm, allowing her to give her account and for Captain Daniel Pitta to head to the crime scene by 11.28 pm. In the course of this, the information would have been relayed to Benicia Police Department. So where did the supposition of a crank call or a car accident originate from. The description given by Stella Medeiros may have been interpreted as a car crash originally and relayed this way, but why would a radio message from a respected officer of the law be interpreted as a crank call. He was a captain reporting an incident on official police channels. Betty Lou Jensen and David Faraday are lying prostrate in the turnout, whether a crash or not, why would Pierre Bidou be under any illusion of a crank call, unless a payphone call had come in slightly earlier than the radio message from Captain Daniel Pitta. The Zodiac Killer made phone calls after both his subsequent attacks, so why not this one. The only difference being, he called it in as a car accident, unwilling to show his hand as the murderer. ​Had James Owen passed the turnout around 11.08-11.09 pm, and the Zodiac Killer had exited the turnout somewhere between 11.12-11.14 pm and headed to Vallejo via Springs Road, his journey time to the payphone at the intersection of Springs and Tuolumne would be approximately 10-12 minutes, placing the 'crank call' at 11.22-11.24 pm, just prior to Stella Borges' meeting with Captain Daniel Pitta at 11.25 pm. The 'crank call' and the radio message from Captain Daniel Pitta would have been received in close proximity, leading to the confusion. The crank call being received slightly before the official police radio message. This is where the 'laughing killer' and the phone call intersect in the aftermath of the Lake Herman Road murders. The Argosy Magazine wasn't finished yet. It continued on further '"The man in the hood" had laughed diabolically as he plunged his knife again and again into Miss Shepard beside the lake. He had also laughed in his phone call to Vallejo Police in December 1968.' Does this validate the claim by Pierre Bidou. If the Zodiac Killer had laughed down the phone, could this be why the dispatcher had interpreted it as a crank call. Additionally, the article stated the phone call was made to Vallejo Police, exactly as the phone call would be 6 1/2 months later, after the Blue Rock Springs Park attack on July 4th 1969. Russell Butterbach of the Solano County Sheriff's Department and his partner Wayne Waterman were just heading onto Lake Herman Road, when they received a call from the sergeant to go to the Hells Angels pad on Warren Avenue, Vallejo. After approximately 30 minutes they then received a double 187 on Lake Herman Road. If a crank phone call from the killer was received after the Lake Herman Road double shooting, then the time of this call, likely just before 11.25 pm, ties in perfectly with a 10-12 minute journey from the turnout to the Springs and Tuolumne payphone. This wasn't the only time that the Zodiac Killer may have directed police to the scene of an accident. Those crime mags often made false embellishments to make the murders even more dramatic than they were. I would stick with Zodiac letters, police reports from Vallejo and Napa which are not in short supply like the San Francisco police reports regarding Stine's murder. One of those mag articles (posted online) did a long article on "Willie the Wood Cutter". An African American man around the age of 50, of slight build, convicted of killing Linda Kanes in Feb. of 1971. She was also a PUC student like Sheppard was. Needless to say, Ken Narlow (with LB still unsolved) was under much pressure to solve a Zodiac Killer like crime in his district. out in Napa county like the 2007 fincher movie suggests. OTH, was Willie just sloppy and left a string of forensic bread crumb evidence? Willie died not long after being imprisoned at San Quentin. Of course your right Shawn, that's why I covered myself with the embellishment angle. I agree the magazine and newspaper articles exhibit a degree of artistic license, although I did find it interesting that five would claim the same 'laughing' narrative, albeit one may have fed off the other. What I am more interested in, is the notion of a possible second phone call, and trying to understand the belief of a crank call. Had the caller laughed or acted oddly during this call, I could understand why the dispatcher took it as a crank or hoaxer. Like I said above, if Captain Daniel Pitta radioed in the LHR incident, I couldn't imagine the police dispatcher saying "stop mucking around, you are a crank." This would have been received not by phone, but through official radio police channels, and I doubt Captain Pitta was joking around. His relaying of the incident I cannot believe was mistaken as a crank call. The article backing up Bidou's claim of a crank call peaked my interest, when it said a call to Vallejo Police in December 1968, unlikely to have been an accident on three fronts. If, and I know it's not confirmed, a call was made from the same payphone twice, this may very well increase the significance of this payphone. It is of course only my current opinion, which may change tomorrow, but I have a strong belief the killer likely lived within 15 minutes walking radius of this payphone, but not at 32 Fresno Street. Land registry records could give us the homeowners, which would open up driving license photographs and vehicle registrations etc. It has to be easier to narrow the field of view, rather than chase a suspect out of a field of 500,000 to 1 million people. Narrow the search field to sharpen the focus down to a few thousand. If that fails pick another hot zone. Or maybe Shawn I have got my wires crossed and need a good lie down. Anyway Shawn I hope I haven't blabbed too long. Cheers Mate. Hey Richard, I just read your piece on Albany looking for commentary on the "Ha Ha Ha" business in the dubious typed Doreen Gaul letter. Do you have any thoughts on the legitimacy of the Ole Killer letter or a Scientology connection given this new 100% true insight into Zodiac's sense of humour? Of course I know you aren't prepared to raise this laughing killer theory up the flag pole yet, but one thing that strikes my about the Gaul letter, which I'm sure you didn't miss, is the 'too beautiful to live' line and the typewriter itself as allusions to Riverside. Something tells me you would have included this here if you gave credence to it, but as you know I do try to pester you after every post! As you say Drew I am not too concerned about the 'laughing killer' angle, that may be as Shawn pointed out dramatic license on behalf of the newspapers. The crank call however wouldn't really have featured in police reports like the BRS phone call, if the call was vague or dismissed, particularly if he didn't specify he was the killer and only referred to it as an accident. Actually Drew you have got one over on me, I hadn't connected the 'too beautiful to live' phrase with Riverside at all. I assume you mean "about time to die." Of course it's typed like the Confession letter, but I never followed this Gaul letter up, believing it to be a poor imitation. It's quite possible that all and a sundry sent or left letters like this to throw suspicion away from themselves, and Zodiac was the obvious beneficiary in sending investigators on wild goose chases. I see nothing in the Gaul and Sharp murders that screams Zodiac, but I know others who disagree. The same goes for the Albany letter. 1] Zodiac died in 1971, or was jailed in 1971 and died incarcerated. 2] Zodiac died in 1974, or was jailed in 1974 and died incarcerated. 3] Zodiac was jailed in 1971, released sometime late 1973, then was rearrested in 1974, and died while incarcerated. 4] Zodiac was jailed in 1971 and 1974 and remains incarcerated likely for other murders. My bet is number three. Serial killers may have hibernation periods of years or in certain cases in excess of a decade, but Zodiac the ultra egotist would only fully stop if he was dead or jailed. The key for me is the March 1971-January 1974 period. This would certainly put a big hole in the 1986 letter being Zodiac, but that's fine. The Albany New York connection I cannot see, what do you think Drew. I think your 1-4 scenarios are all very plausible. I've been staring at them for 20 minutes! For me the Zodiac is either a four attack strictly Cali killer who stuck to letters after Stine, or his kill count was not ridiculous and he in fact was prolific. I'd like to be bold and say it is one of those two extremes. If we learn that Zodiac killed anyone beyond the cannon then we'd be wrong about his limitations, his need for attention, and would have to revise. The Exorcist letter sure looks authentic, a perfect 340 referencing dismount for the character that may have completed the disinformation barrier he was building. If Exorcist is a hoax it is a masterpiece. It would certainly be a more graceful exit after a long campaign than the LA letter or the Pines card. 71-74 could definitely be jail time. I don't know about death, he could have just returned to a risk-free existence content with needling his fellow office coworkers. The Albany connection is one I hold onto with the same attitude. The Ferrin/Phillips 66 connection interests me more than the Gaikowski or Scientology/Bruce Davis links. If Z was more prolific than the cannon, Albany is in, otherwise I dismiss it. In the Zodiac letter death tally it would be number 8 if we allow that Z was one of two killers on this occasion and therefore only claimed it as one. Because Gaul was sexually assaulted, we kind of have to discard it unless we are rebuilding the Zodiac profile from scratch or saying that he killed Sharpe but left the letter with Gaul... pretty weak I suppose. Also the nooses or possibly Navajo symbols (The Foreigner put an interesting link on ZKS: http://www.cuentoseningles.com.ar/articles/business/goodwill.html) or however you want to interpret the imagery seems a poor imitation of Zodiac's art skills and to my eyes appears to total ten not eight. One could say it was not intended as a death tally here and that would also work against its authentication. The all caps typing and language is suggestive of Riverside, and the location does not misalign with the idea that it was done by The Riverside killer (especially because the Riverside link wasn't public in Nov 69), but as far as a Zodiac link we do have to wonder why he would type this and then revert back to handwriting. Perhaps he was away from his paper stock and pen, but at this point I have rattled on long enough that I have talked myself out of it! You caught my screw up! The "too beautiful to live" line which I thought was in the Riverside letters was indeed a confused amalgamation in my mind of "She was young and beautiful but now she is battered and dead" with "Time to die" and "Bates had to die". The unconfirmed RPD and LHR phone calls are likely to keep me guessing for the foreseeable future. If authorities have withheld information about either of these calls then I think they have shot themselves in the foot - not that that would be wholly unexpected. Anyways, thanks for everything Richard, much appreciated!